http://www.vladtv.com - Lord Jamar addressed A$AP Yams' claims that 2014 was the worst year ever in rap music, and the Brand Nubian rapper agrees this year could indeed be a strong candidate. He adds that there weren't a lot of strong albums that were released when compared to last year when J. Cole, Drake, and Kanye dropped strong projects. 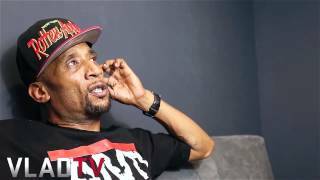 Nov 18, 2014 · 0 comments for "Lord Jamar: 2014 Could Possibly Be Worst Year Ever In Rap Music"
From Vlad's Couch: Lord Jamar "2014 Could Possibly Be Worst Year Ever in Rap Music" Discussion in 'The Booth' started by Xenos, Nov 18, 2014. Is Dej Loaf a true AG? ?